Crave Brothers Farmstead Classics® are specialty, farmstead cheeses handmade with great care using Old World techniques. Cheeses produced include Fresh Mozzarella, Mascarpone, Farmer's Rope® String Cheese, Part-Skim Mozzarella, and Fresh Cheddar Curds. Crave Brothers Farmstead Cheese handcrafts their cheeses right on their farm in Waterloo, Wisconsin, using only the freshest, high-quality milk from Crave Brothers Dairy Farm. Milk is piped directly from the dairy farm to the cheese factory within hours of milking for an incredibly flavorful, truly farmstead cheese. Our cows are fed homegrown, high-quality corn, alfalfa, and soybeans. They receive plenty of exercise, fresh air, and individualized care. The Crave Brothers farm emphasizes conservation and sustainable practices and the utmost consideration is given to what is best for the cows, the environment, and the consumer. Crave Brothers uses 100% green power, and practice water conservation and recycling. We are a carbon-negative company, which means more power is produced with our biodigester than we use for the dairy and cheese plant. The Crave Brothers farm in harmony with the land to produce quality milk and award-winning cheeses. George Crave, President of Crave Brothers Farmstead Cheese, LLC, is a licensed cheesemaker and oversees plant management and cheese production. He has traveled to Italy, France, and Switzerland to study cheesemaking and affinage. George is a 1978 graduate of the University of Wisconsin-Madison Farm & Industry Shortcourse. He served on the Council for Agricultural Research, Extension & Teaching (CARET) for the UW-Madison College of Agriculture & Life Sciences and is a founding member of the Professional Dairy Producers of Wisconsin. 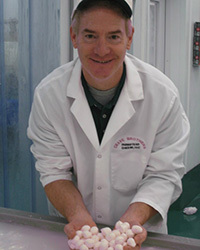 George is also a member of the Wisconsin Cheese Makers Association and the Wisconsin Specialty Cheese Institute. George and his brothers were recognized in 2008 as World Dairy Expo Dairymen of the Year and in 2010 by the Wisconsin Dairy Business Association as Advocates of the Year. The Crave family received the 2017 Wisconsin Family Business of the Year award. They hosted the 2009 Wisconsin Farm Technology Days, a three-day outdoor farm show with 80,000 attendees. George is a 4-H leader and member of Holy Family Catholic Church. He and his wife Debbie have three children - Patrick, Brian and Roseanne. Mascarpone from Crave Brothers is crafted from fresh, sweet cream. Luxurious and velvety, it is perfect for both sweet and savory culinary applications. Stir into soups, sauces, pasta, risotto, or coffee. For desserts, it is delicious in tiramisu, cheesecakes and frostings. Pair with strawberries, honey, ginger snaps, chocolate, lemon, or sparkling wine. Fresh Mozzarella from Crave Brothers is a fresh, milky cheese great for salads and appetizers. Serve it with fresh tomatoes, drizzle with olive oil, and sprinkle with fresh basil. The cheese is packed in water to keep it fresh. Slice onto pizzas and flatbreads, or toss in pasta salads. Delicious with grilled vegetables or prosciutto paninis. Pair with fresh tomatoes, fruit, basil, pesto, olives and tapenades, and cava or other sparkling wines.